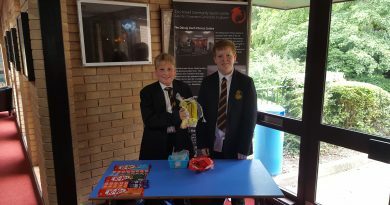 On behalf of the Governing Body of Crickhowell High School, we would like to bring your attention to the current financial situation at Crickhowell High School and ask you to contact your local and national representatives if you feel, as we do, that the current situation is unfair. The tables below compare the funding we get per student with other schools. All the data in the tables referenced below has been collated from the MyLocalSchool website at http://mylocalschool.wales.gov.uk/ and is based on current analysis dated February 2016. Our rationale is not that we need more money than any other school, but rather that our students should have parity of funding with students in other schools. Our students are being disadvantaged as they do not have parity of funding with their peers in other secondary schools. Indeed in many cases our funding is more than £800 less per student than other schools and the cumulative effect of this is absolutely astonishing. We feel this level of disparity cannot be justified. 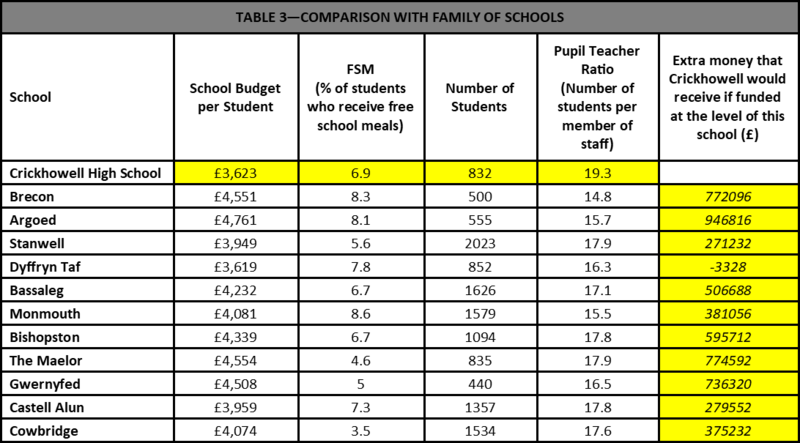 Whether we compare ourselves to Powys (Table 1), our closest neighbours (Table 2), or to our Family of schools (Table 3) we find ourselves substantially underfunded and therefore always at a disadvantage. The final column on the table indicates how much more funding Crickhowell High School would get per year if we were funded at the same level as each named school. 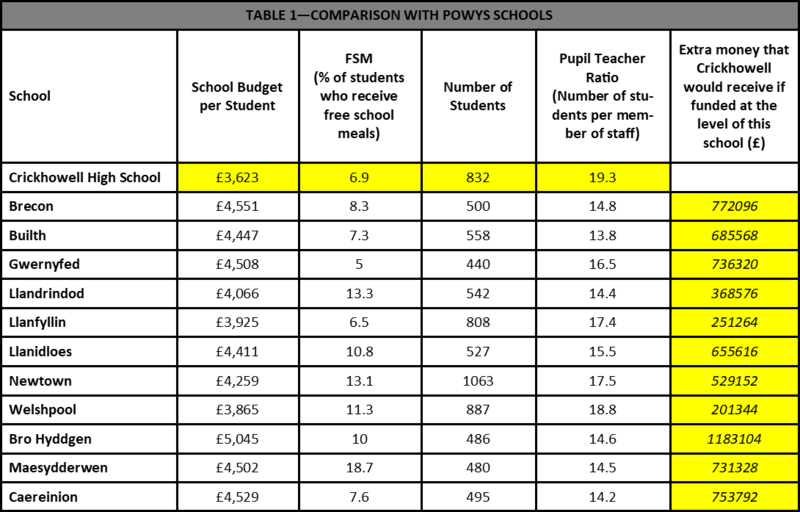 Thus one of the schools in Table 1 has a budget per student of £4,529 compared to Crickhowell who have £3,623 a difference of £906. 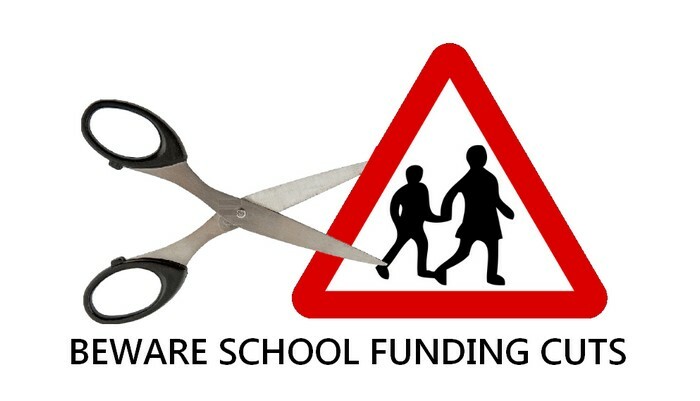 If our 832 students were funded the extra £906 then we would get another £753,792 a year (832 x 906 = £753,792) and so on for each school. 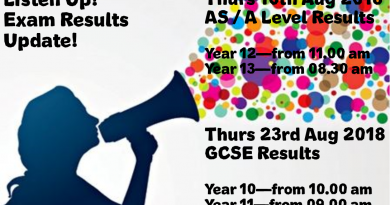 As our excellent exam results reflect year on year and our pupil teacher ratio shows, we run a very efficient school. However, despite our best efforts the school budget has recently gone into a deficit due to this very significant underfunding. This situation is now beginning to seriously impinge upon our standards and future prospects for school improvement. We are being asked to cut subject choices at KS4 and KS5 and reduce staff numbers. We will not be able to maintain the excellent standards we currently achieve if this financial situation continues. This is neither fair nor prudent when this community school adds so much value to our local and wider community, as well as to Wales as a whole. If we had an extra £400,000 per student, regardless of the figures in the tables, we could employ the staff we need, provide the excellent education our students deserve and have money to spare to pay off our deficit within 2 years. It just seems so unfair to our students that we are so chronically and consistently underfunded. Table 4 figures are, for the Governing Body, the straw that finally broke the camel’s back and has prompted this correspondence. This shows (using the same data source) that the situation grew significantly worse in 2017 as compared to 2016. 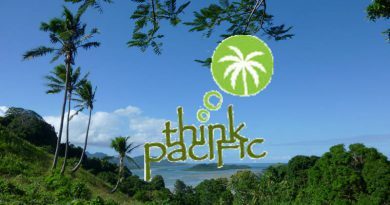 Obviously we have made, and continue to make, representations to Powys County Council, as well as the Welsh Government. lf you feel, as we do, that this situation is unfair, please contact your local and National representatives to see if we can improve the situation by working together. Some of these representatives are listed below. There will be a meeting for parents on 22nd November at 7:00 pm in the school if you would like to discuss the issues outlined in this letter with members of the Governing body.